There has been a recent request to add to for loop in the Object Pascal language the ability to add a step, that is an increment different from one. Here is an alternative implementation using a for..in loop and a custom enumerator. 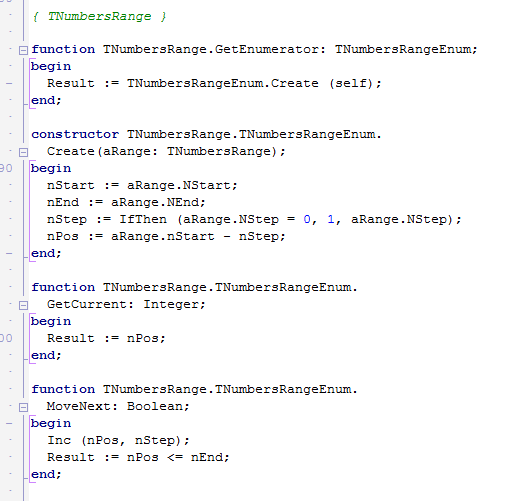 Once I saw the request it reminded me of a demo I have in my Object Pascal Handbook (which originally came from my Delphi 2007 Handbook), The demo is available at https://github.com/MarcoDelphiBooks/ObjectPascalHandbook/ blob/master/10/NumbersEnumerator/NumbersEnumerator_MainForm.pas and shows how to build an enumerator over a range of numeric value. The only missing feature is the ability to have a Step property to skip value in the sequence, counting by 2, 3, 4 and so on. The other issue of the demo is it uses an object of a class, which implies the need of creating and freeing the object. 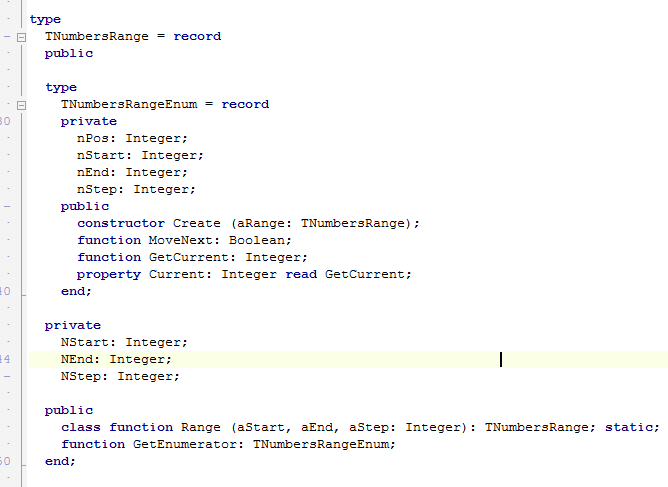 Also the way properties are set is a bit cumbersome. Of course, you could also define a global Range () function, rather than a class method. Below is an image with the type definition, followed by a second one with the core implementation. They are followed by the code itself, which might not be as well formatted and readable (hence the images). Feel free to use it any way you like. an end for negative step values. an end value by some step value. make up for that lack. than 16K is just an antiquated idea.